Hall of Gods is a five reel, three row slot game themed around the traditional pantheon of Norse gods. The game has 20 pre-set paylines, a theoretical return to player percentage of 95.5% and loads of added features like free spins, scatter wins and a bonus game. That bonus game too, offers the chance to win one of three fabulous progressive jackpots. With its fun theme and providing access to three separate progressive jackpots, Hall of Gods has a lot to offer to players. Below, you will find all of the crucial details regarding the game’s top jackpot, special symbols, paytable and betting options. Arguably the most attractive element of the Hall of Gods slot is the opportunity which it offers to win one of three progressive jackpots. Those jackpots are of three different sizes and are called the Mini, Midi and Mega Jackpot. The Mini Jackpot tends to provide payouts in the thousands of pounds, the Midi in the tens of thousands and the Mega in the hundreds of thousands or even over one million. 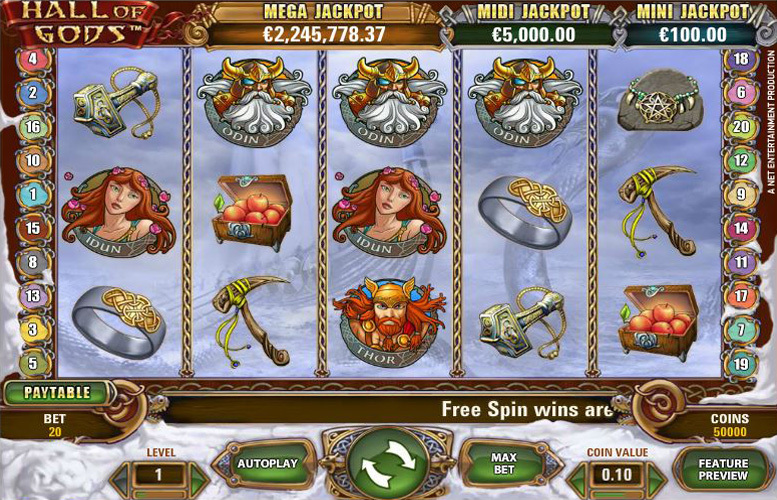 Those progressive jackpots are won by matching jackpot symbols within the slot’s bonus game, which is triggered when three bonus symbols are revealed following a spin in the main game. Away from the progressive jackpots, the top payout possible occurs when five of the most valuable white bearded god symbols line up along a payline. That combination pays out at a rate of 4000 times the bet level, so at bet level five – and with the three times multiplier that comes during free spins in the game – that results in a 60,000 coin jackpot. At the top coin value of 50p, that jackpot is worth a whopping £30,000. Hall of Gods is quite a simple slots game and as such has just three special symbols involved in its gameplay. The first of these is a straightforward wild symbol, which can appear on reels 2, 3 or 4, substitutes for all symbols except for scatters and bonuses and expands to cover its whole reel if a winning payline is present. The second special symbol is the scatter symbol and it is these symbols which trigger the game’s free spins. If three appear, ten free spins are triggered, four result in 15 spins and five return 20 spins. All free spins are played at the same bet level and coin value as the spin which triggered them and all winnings from free spins have a x3 multiplier applied to them. The final – and arguably most important – special symbol of the Hall of Gods game is the bonus symbol. Three of these appearing anywhere in the main game or during free spins activate the slot’s bonus game. 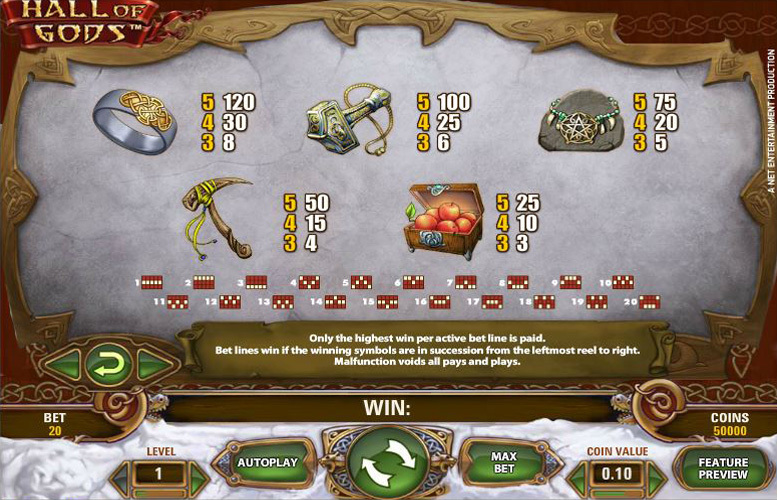 Within that game, players must click shields to reveal either jackpot symbols or coin amounts. If three matching coin amounts are revealed, the player will receive a coin win equal to that amount up to a maximum of 7,500 coins. If three matching jackpot symbols are revealed however, the player wins the corresponding progressive jackpot. The current size of each progressive jackpot is displayed at the top of the game screen and the chance of winning a jackpot correlates directly with both jackpot size and the player’s bet amount. All three jackpots are progressive with 1% of each bet across the casino network contributing to both the Mini and Midi Jackpots, and 4.9% of each bet contributing to the Mega Jackpot. The most lucrative jackpots that are winnable through Hall of Gods are clearly those three progressive jackpots, but there are also valuable payouts available from winning payline combinations. The most valuable combination within the game is that made up of five of the white bearded god symbols, which pays out at a rate of 4000 times the bet level. If that combination is achieved during free spins (with the associated x3 multiplier) and at bet level five, therefore, that results in a jackpot of 60,000 coins. At the highest possible coin value of 50p, that jackpot is worth £30,000 to a player. The second most valuable combination possible in Hall of Gods is made up of five of the red bearded god symbols and that pays at a level of 2000 times the bet level. In the same circumstances as above, therefore, that combination can result in a payout of 30,000 coins or £15,000. 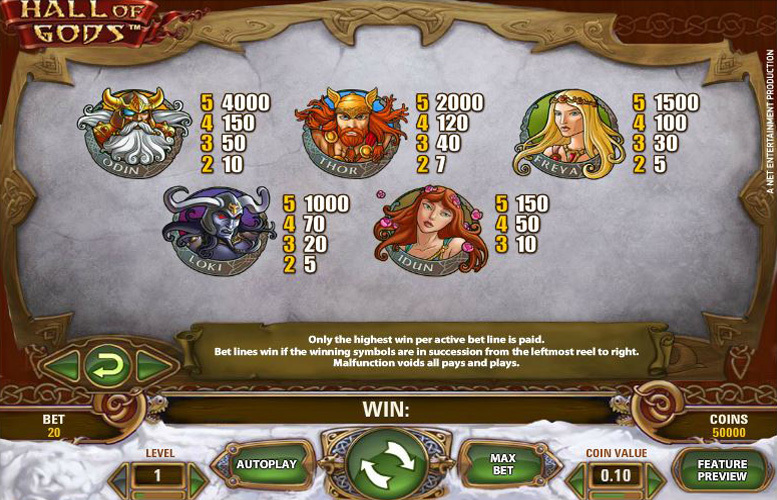 In order to control the amount they wager per spin, players of the Hall of Gods slot can set both the bet level and coin value for each spin. There are six coin values to choose from between 1p and 50p, and five bet levels from 1-5 which determine how many coins are bet per payline. If they set a coin value of 1p and bet level 1 therefore, a player can bet the minimum of 1p per payline which equates to a total bet of 20p. Setting a coin value of 50p and bet level five meanwhile, results in the maximum wager of £2.50 per payline or £50 in total. 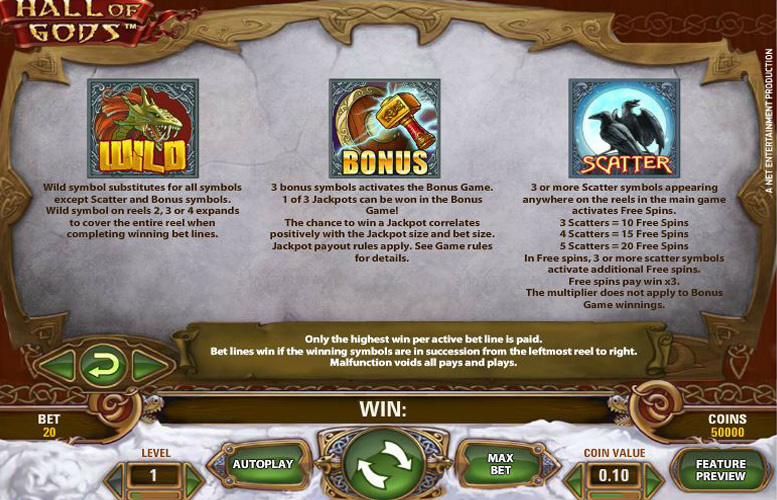 Hall of Gods is a slot game which rates highly in almost every possible category of comparison with other slots. The game has a fun and yet simple theme, and builds in a number of added features which enhance what is a simple and easy to understand main game. What’s more, Hall of God’s bonus game also has the distinct advantage of providing players the chance to win one of three really generous progressive jackpots. Away from those progressive jackpots too, the payouts from the main Hall of Gods game can also be really impressive and are simple to achieve. Different betting options are also readily available to players and whilst these are perhaps slightly less varied than with some games, they are likely to be more than sufficient for the majority of players. This game has a rating of 5 / 5 with 432 total reviews by the users.